In 1968, Charles Krell rescued Miriam Lerner from an icy suburban Philly quarry. Now, she's helping Krell's daughter to honor his legacy. Linda Krell, left, and Miriam Lerner, right, sit on a bench dedicated to Krell's father at the Loch Alsh Reservoir in Upper Dublin Township. Charles Krell drowned in a nearby quarry 50 years ago after rescuing Lerner during an ice skating accident. For all that Miriam Lerner has tried to do for the family of Charles Krell, who drowned while rescuing her from frigid waters in the Philadelphia suburbs decades ago, she doesn't necessarily feel any closer to him. "I still don't know who he was really," Lerner said. "I know his daughter and I knew his wife. I still don't have a great beat on him." Nevertheless, Lerner is forever connected to Krell, who on February 24, 1968, plunged into the broken ice over a quarry in Upper Dublin Township, Montgomery County, to rescue her after an ice skating trip with her father turned dire. For that, Lerner will always remember this about the man: "He ran toward trouble." In the years since that tragic Saturday, Lerner has connected with Krell's daughter, Linda, as both have grappled with how to find closure. The results: A book, a bench, a hero remembered, and a lasting friendship. As a girl, Linda Krell used to run to the window when she heard the "whoosh" of her father's car pulling into the driveway. Dad would burst in, and, if there was enough time before dinner, take his daughter fishing at the reservoir, near the quarry where he would eventually drown. Or, he would take her shooting; he participated in rifle competitions, but would never hunt. "He could never kill anything," Linda Krell said. In addition to being a "hands-on parent," Charles Krell was a helper who didn't hesitate to risk his own life. Once, at a construction job, he threw himself onto a fellow worker who had caught fire, wrestling him into the dirt to douse the flames. Another time, in the same quarry, he saved a fisherman who had fallen in. The Krell family would only hear about these acts of bravery after his death, as Charles Krell didn't want to worry his wife, Annie. Before getting married in 1989, Lerner's name was Miriam Nathan. The Nathan family moved from Houston to the Philly suburbs in 1967. The first time it snowed, 9-year-old Miriam Nathan was mesmerized by the novel white flakes falling to the ground. Her father, Charles Nathan, wasn't familiar with cold weather either, and before he was to take her to a friend's birthday party on Feb. 24, 1968, took her to the quarry to go ice skating. The tranquility of Veterans Memorial Park, with its children's play area, walking track and acres of field, belies the tragedy that occurred 50 years ago at the quarry beneath the grass. 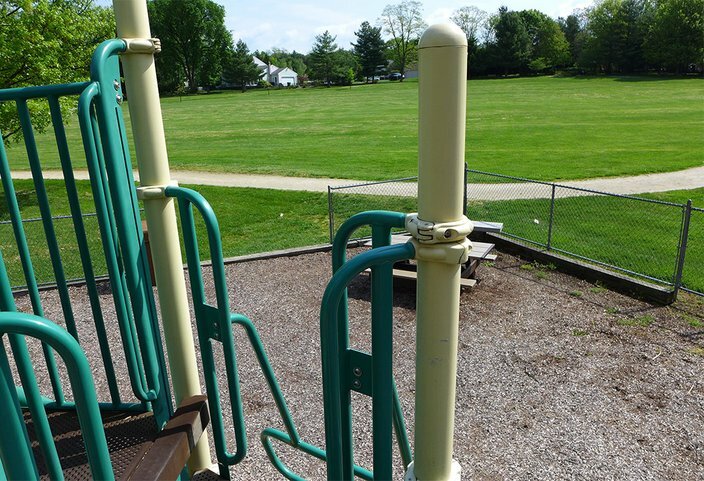 Formerly known as Quarry Park, it sits at Highland Avenue and Farm Lane in Upper Dublin Township. Charles Nathan had brought army belts to use as rope just in case the ice crashed and they fell in — but the water was shallow, he assured her, so they didn't need to worry. I heard a sickening cracking sound, tin foil crumpled in your fist and then splash! Daddy fell in. At first he was calm and so was I. I think when his feet didn’t touch bottom as quickly as he had predicted he became worried. “Go over and get the army belts,” he called out to me. I skated over to the bank and got the belts and then got back to him as fast as I could. I stood near the hole where he was thrashing and threw one end to him, and then attempted to pull him out, all one hundred fifty water-logged winter-clad pounds of him. I slowly slid towards the hole until the ice gave way beneath me too and I was deposited into the freezing water with him. Two men came rushing to their rescue. The second, "Mr. Prinz" (identified in old news articles as Jake Prins), was able to pull the Lerners out by extending them a long metal pole. But the first — the man who laid across the ice, reached out with his hand and was pulled into the water with them — was Charles Krell. The coroner gave them a report of the condition of Mr. Krell’s body after it had been identified and taken to the morgue. His jacket was shredded in the front. His chest was cut in several vertical slices. Skates. Kicking, flailing skates. In numbed feet attached to numbed legs frantically dog paddling, trying to keep a sodden-clad girl above the water. Mine. He held me, he held me while I unknowingly kicked him, shredded him, he held me. And he lifted the fish to freedom and life as he sank, sank, sank. Linda Krell, 19 at the time, was still living at home. She arrived at the house with a friend when she heard the radio announcer in the car say a man had drowned in Upper Dublin. What a shame, she thought. Her parents were supposed to go out that evening. Linda Krell would always do her mother's hair. Dad was never late. But as they kept looking at the clock, the minutes kept ticking past when he was supposed to arrive. He'll be back soon, she assured her mother. Eventually, Mrs. Krell turned to her daughter. "She said, 'No, your father's not coming home. Something happened.'" The knock on the door came. The mayor and a police officer were there to deliver the news. A stunned Linda Krell first tried to shut the door on them, and when she gave up and let them in, they told her that Charles Krell was gone. Refusing to believe it, she kept asking: But that doesn't mean he's dead, does it? She couldn't accept it at the time. But the truth was, her father was never coming home. According to a Philadelphia Inquirer report about the incident, Charles Krell's body was recovered from the water four hours later. He had sunk 40 feet to the bottom of the quarry, where signs warned "Keep Out" and "No Trespassing." Police said they frequently had to direct children off the same ice. There was "animosity" toward Charles Nathan afterward, according to Miriam Lerner. While he and his wife, Sylvia Nathan, attended Charles Krell's viewing, his personality wasn't equipped to deal with such a sensitive situation. And while Miriam Lerner noted her father may not have known better about the thin ice — "We came up from Texas and there's no ice in Texas" — she understands why blame was directed at his "stupidity." "My dad was a great guy but wasn't the most touchy-feely — like a bull in a china shop. He did this really stupid thing that killed somebody," Lerner said. A man fishes at the Loch Alsh Reservoir in Upper Dublin Township near the bench dedicated to the memory of Charles Krell. Her father's death created predictable hardship. Annie Krell had to keep working. Gone was Linda Krell's dream of going to college – the money wasn't there and she had to go work in offices. At her wedding two years later, her father was missing. But past the financial difficulties and immediate emotional backlash, a singular suffering has remained. "Till this day, I can still feel the pain. And it's 50 years [later], and I'm a 70-year-old woman, and yet I've always missed him," Linda Krell said, fighting back tears. Lerner's parents tried to hide her from the aftermath. They wouldn't allow her to see the body at the funeral home. In the months after the incident, she'd walk into a room and her parents would fall silent. The Krell family never blamed Miriam Lerner for their father's death. How could they? She was just a little girl. "My mother was always saying, 'I wonder how that little girl is today.' She always had this concern for her," Linda Krell said. Every Feb. 24 from 1969 onward, Miriam Lerner would think about Charles Krell. When she was 29, her mother committed suicide. She drove down to New Mexico, where her parents lived, to be with her father. Some friends accompanied her on the ride, and while telling them about the incident, the thought came into her head for the first time: Why haven't I ever tried to find the Krell family? But she didn't act on it. The anniversary would pass, and she thought reaching out might upset her father, who died in 2001. It wasn't until 1997 that Miriam Lerner would take out a small ad in the Philadelphia Inquirer, asking for the family of Charles Krell to reach out. That summer, a friend of Linda Krell was flipping through the paper in a waiting room and saw the ad. Neither of them got the newspaper at home, so neither would have seen the ad if the name "Krell" hadn't caught her friend's eye. "I don't know how much you believe in the supernatural or whatever, but you can't help but think my dad had a hand in this," Linda Krell said. Linda Krell gave Miriam Lerner a call. "She was incredibly open about it," Krell said of Miriam's willingness to talk about her father. Both of their voices were shaking. "She was scared, I was scared." The two formed a friendship over the past two decades, checking in with each other sporadically and meeting up on a few occasions. 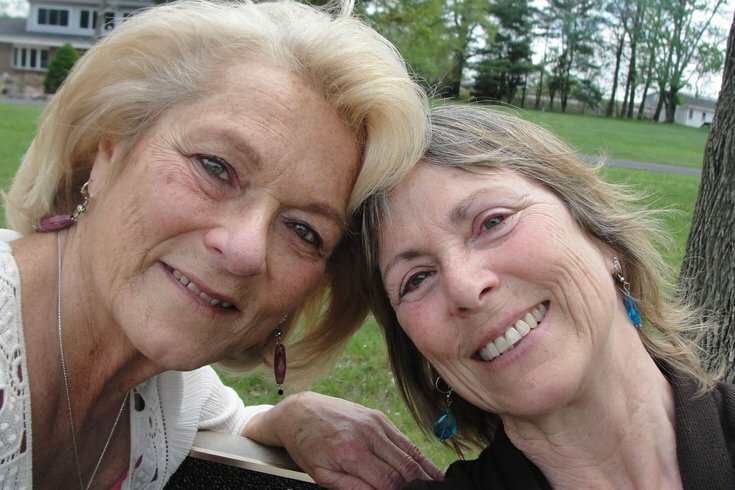 Miriam even got to meet Linda Krell's mother before her death. Lerner, now 60 and working as a sign language interpreter at the Rochester Institute of Technology in New York, considers writing a side gig. Her book, "No Center Line," is a combination of "poetry, prose, and whatever garbage is running in my brain," she said. It's a collection of non-fiction pieces, including a chapter about Krell's death, titled "Deaths 3." Lerner made sure to call Linda Krell so she could make the account as accurate as possible. After the book's release Lerner was left wanting to do more to honor Charles Krell's legacy. Linda Krell had been hurt years ago when a book written about Ambler heroes didn't include her father. She also thought that Veterans Memorial Park, the playground and walking path built on five acres of the old quarry, could have been named for her dad. She wanted people to know about the father who told her and her sister that no one could stop them from being whatever they wanted to be just because they were girls. She wanted people to remember the good man who, as a construction worker, gave up a job at the union hall to another man with four young kids because he needed it more. Lerner wanted the same thing. The quarry has since been filled in and new houses built on top of it. So, Lerner dedicated a bench overlooking the nearby Loch Alsh Reservoir to Charles Krell. The plaque reads that, in these waters, Krell "sacrificed his life to save a little girl." 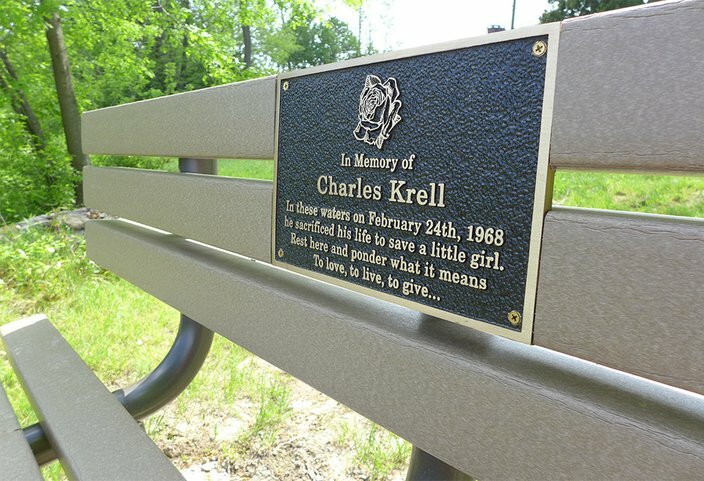 A bench at Loch Alsh Reservoir in Upper Dublin Township recalls the heroism of Charles Krell, who saved a young girl from drowning after she fell through the ice at a nearby quarry in February 1968. Krell did not make it out of the icy water alive. Lerner admitted that the message is inaccurate, as the rescue happened in the quarry, not the reservoir. She surprised Krell with the bench a couple of weeks ago, and apologized for it not being in the right location. But the apology was unnecessary. Krell told Lerner that her dad used to take her fishing at the reservoir as a girl. From the vantage point of the bench, Linda Krell can see the exact spot where she and her dad used to sit with their fishing poles. "My heart was so full of joy and love when she did that. I cried, we laughed. She's a sweetheart, even before the bench," Krell said. "I tell her all the time how my proud my father would be of her, because she grew up to be a lady who gives back." Together, they placed flowers into the water. As they floated away, one drifted back and lingered. Krell believes it was her father letting them know he was there. Lerner is just glad she was able to give the Krell family the sanctuary they've always deserved. "All of these things we do for dead peoples' names are for living people, dead people don't care. This was for Linda and her family," Lerner said. "It was to put a period at the end of the sentence, to have a physical repository for their family, that he was a hero. He really was." Both Lerner and Krell said they have closure. And both still have a hard time believing how, in the wake of tragedy, they've been able to find cathartic joy in each other. Charles Krell's heroism some 50 years ago – that selfless act of keeping a little girl afloat in the hole in the ice till help arrived, and then heaving her up and out of the frigid water even as he went under never to surface again – had bound them together for eternity. "I think when he saw you there in that hole he never hesitated," Linda told Miriam. "He saw a little girl, and to him you were his daughter." This article has been corrected to show that Miriam Lerner's maiden name is Nathan, and that her father's name was Charles Nathan.